Press again <CTRL>+<F8>, and it will select the next perspective. 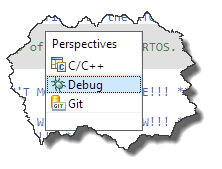 This entry was posted in CodeWarrior, Debugging, Eclipse, Freescale, KDS, MCUXpresso, MCUXpresso IDE, NXP, Tips & Tricks and tagged Eclipse, perspective, Shortcut, software, Tips&Tricks, Toolbar by Erich Styger. Bookmark the permalink. I also love key shortcuts. They speed up my work processes a lot (I usually put them on some F-keys). Sadly Eclipse doesn’t support key shortcuts very well. What ever I try, it always opens the “run as” list. 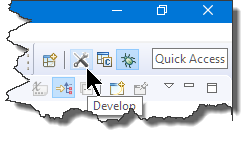 Same behaviours exists when you click on the run/debug button in the toolbar.